Introduction EMSL Analytical, Inc. has 16 CDC ELITE accredited labs and is available to accept Legionella samples for analysis. An increase in Legionella outbreaks in nursing homes and hospitals are becoming an ongoing concern for many. In 2015, the Centers for Disease Control and Prevention’s (CDC) Morbidity and Mortality Weekly Report stated that 553 of the 2,800 cases of Legionnaires’ disease were linked to healthcare facilities. The report disclosed that 66 of those hospital or nursing home cases were fatal. Legionnaires’ disease is a severe form of pneumonia that is caused by Legionella bacteria. Legionnaires’ occurs when water that contains the bacteria is aerosolized and then inhaled or aspirated. Symptoms of the disease include fever, chills, coughing and shortness of breath. Those with a weakened immune system, chronic lung disease and the elderly are at higher risk of developing Legionnaires’. EMSL Analytical, Inc.’s networks of Legionella testing laboratories provide Culture Testing, Polymerase Chain Reaction (PCR), Sequence-Based Typing and Whole Genome Sequencing. For additional information about the difference between these types of testing, please contact Christopher Goulah, Ph.D., at (716) 651-0030 extension 1407. As an additional resource, EMSL is offering a free Legionella Pocket Guide that offers information the bacteria and different sampling techniques. To request a free copy, click here. 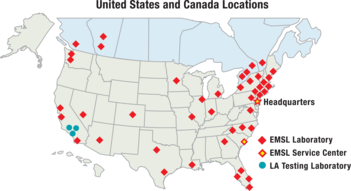 To view a complete list of EMSL’s Legionella laboratory locations, accreditations and capabilities, please visit www.legionellatesting.com or www.EMSL.com . For more information, please contact our Customer Service Center at (800) 220-3675 or email info@EMSL.com.